In this world of smart technology and interactive interfaces, designers for UX (user experience) are high in demand. But as UX designers, you also have a lot more to prove than you realize when you apply for a UX or UI position at any tech conglomerate. You’ll find that your competence must necessarily reflect in the very interface of your own application. This is true for all resumes, but no regular Resume Template will work for you the way it can work for others. Don’t fret. 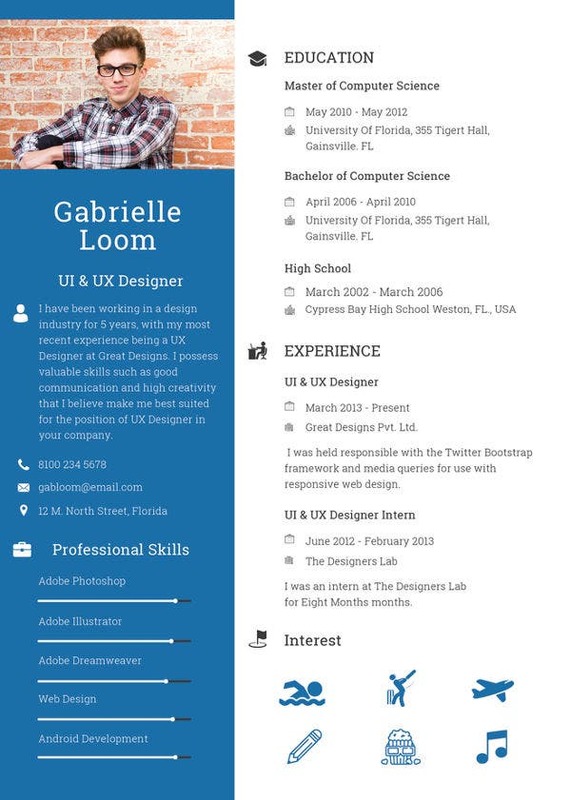 Here we have brought together a collection of some extremely well-designed and practical resume samples for UX designers. Download them now for free as Word and PDF files that you can modify and use right away. 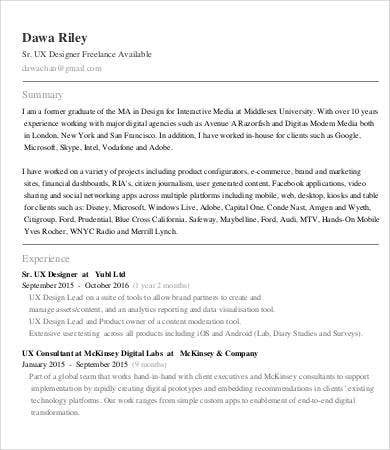 Why Can’t I Use a Regular Resume Template? You certainly can use a Basic Resume Template, if you want to present yourself as a regular employee. And we stock many great examples of regular resumes as well. 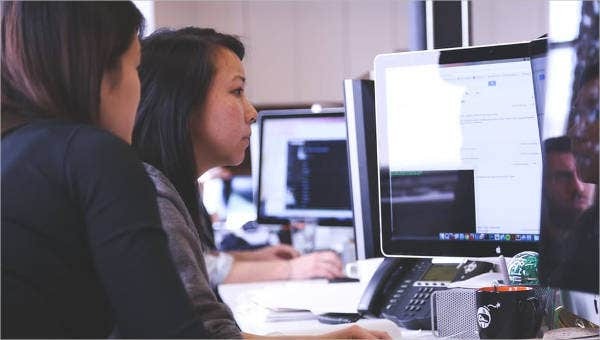 But the tech industry is all about optimization, and to optimize your chances of success seeking a job in your line of work, you’re going to need a resume tailored for your application. 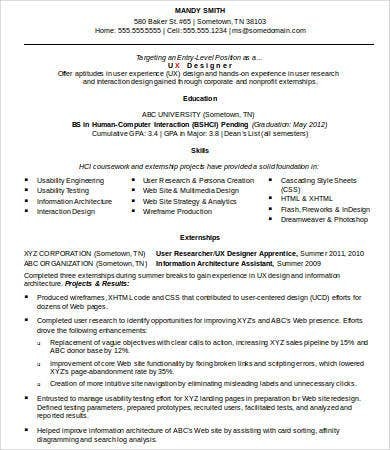 These resumes are examples of a targeted resume. A targeted resume is upfront about the value proposition in hiring you instead of anyone else. It shows how your qualifications are specifically matched for the job opportunity you are applying for. 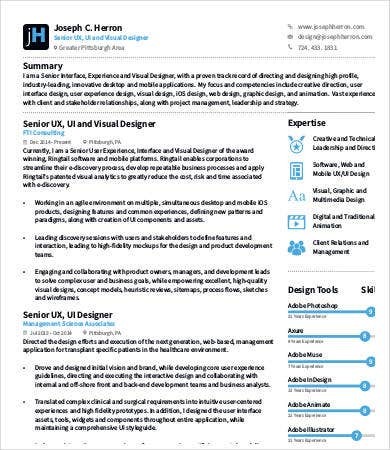 Senior UX Designer Resume for those seasoned pros who’ve been doing this since UX was practically invented. 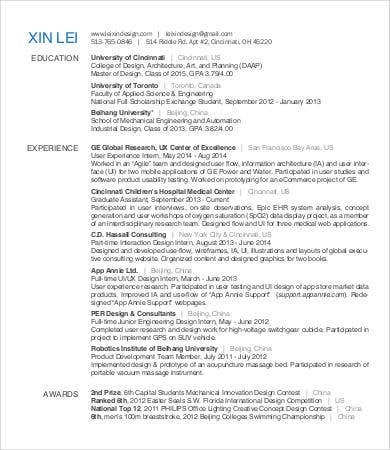 Also compare with Experience UX Designer Resume. 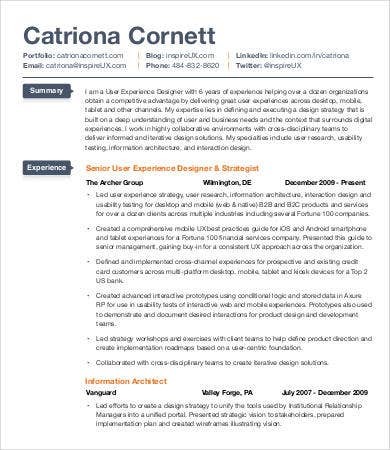 Entry Level UX Designer Resume, for those just starting out, the beginner’s counterpart. 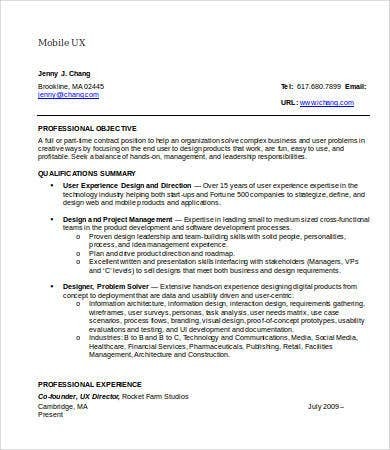 Mobile UX Designer Resume, because user interfaces and therefore user experience for mobile is vastly different from that of a desktop or a larger screen. 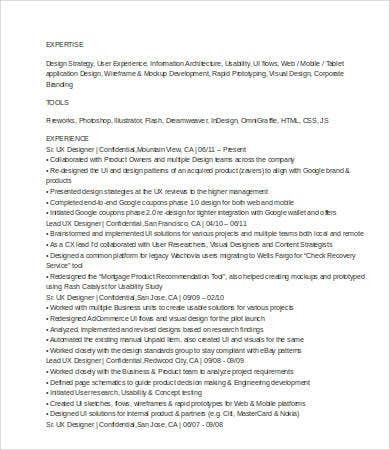 Freelance UX Designer Resume, for those who want to keep their hard-earned flexibility and autonomy instead of being rooted in-house. 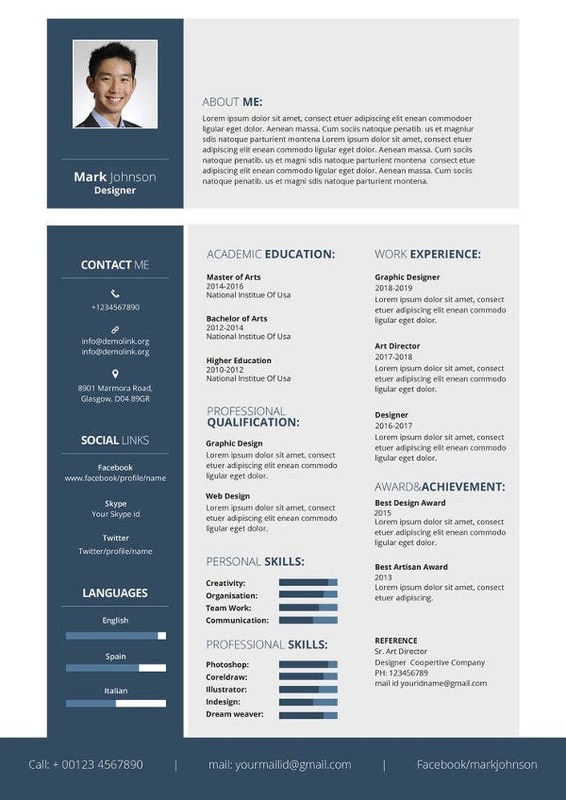 These free samples combine all the necessary elements of a good resume with specific metrics for tech designers. You can easily see how artfully and practically the information is spread out on each example. This is what you should aim for. Don’t go overboard on design; it will make you seem desperate. Strike a balance between functionality and aesthetics, the mantra of all good interface design. The hiring manager should enjoy reading your resume¯what could be better proof of your qualifications than that? It might not be a stated requirement at all when applying for a designer’s position, but it is a brilliant opportunity to showcase what you’re capable of. Don’t miss the chance to prove yourself. 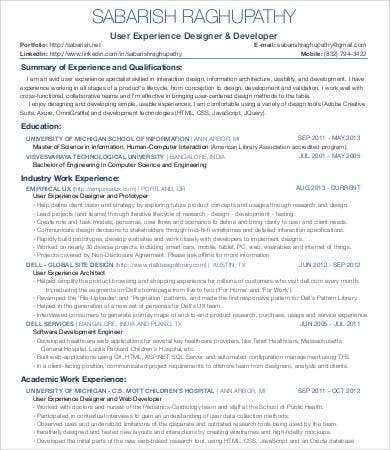 Tech person but not a designer? Don’t get left behind. Check out Template.net’s archives for a great Programmer Resume Template to jump-start your career to the next level.